The last few weeks have been particularly hectic for me. I have been massively distracted by the Olympics, and needless to say, I wish I’d maintained the skills I had in hockey when I left college! Nevermind though, perhaps I could take up handball in time for Rio. Apart from sport, I have kept to my books a little bit, and whilst I clearly haven’t attended to my blog, that doesn’t mean to say that it hasn’t been a platform for activity. I have had several requests and queries from folk including the desire of an elderly lady to deposit her great great grandfather’s photograph album of Halton House, Buckinghamshire at the archives there, through to prompts and ‘shout-outs’ regarding academic courses, image copyright and project developments. Besides all that, I’m about to move house too. After almost two years in rural Oxfordshire, I am packing my things and going to the Big Smoke of England – London. And so, this got me thinking about elements of house moving on a larger scale than that of a standard three bedroomed semi-detached house. Typically, the country house is synonymous with patrilineal inheritance, static wealth and legacies, so much so, that we forget how common it is for houses themselves to have had several occupiers and owners over the decades or centuries. Houses and portions of estate might have formed part of a bargaining tool in times of political turmoil, or merely advertised as leasehold properties in newspapers, rented out to close friends or family, or simply sold on the market. Whatever the circumstances, many houses have seen a great deal of movement. Imagine the hubbub as the house move gains pace; the packing of crates and boxes, the taking of inventories, the to and fro of servants and agents, the anguish over a lost item. Another aspect of the large-scale house move would be in building and creating the country house from the moment the first stone was set. Landed gains of the 16th century after the Dissolution of the Monasteries, or industrial wealth of the 18th and 19th centuries are part of this debate, but I want to take a peek at one family – the Cokes. Their ‘house move’ epitomised the desire for residential expansion in the 18th century as well as conspicuous consumption of fashionable goods and design on a large scale. It also highlights the giant sense of resettlement in order to gain dynastic stability for an elite family. The Cokes owned the manor of Minster Lovell, Oxfordshire from the turn of the 17th century. The manor house at Minster Lovell is now a ruin perched romantically on the edge of the River Windrush as it winds away from the Cotswolds. There had been a house on the site since the 12th century, but the ruins are mainly what remains of a large new structure built in the 1430s by William, Baron of Lovell and Holand. William and his descendants, most notably his grandson Francis Lovell were to make good political connections and riches through marriage, and loyalty to the king. This was, however undone when Francis supported Richard III at the Battle of Bosworth. The Lovell estates were turned over to the Crown, and so Minster Lovell was stripped of its owner/occupier. The Cokes made their appearance by 1603 when it came into the possession of the most successful and influential lawyer of his time Sir Edward Coke, who may have viewed the manor house as a retreat or lodge close enough to England’s capital, but far away enough to experience peace and serenity. In any case, the house itself provided him with a good rental income. It is likely there was a residence on the Holkham estate in the sixteenth and seventeenth centuries, though much of that part of the Norfolk landscape was barren marshland before Thomas Coke reclaimed it in 1722 for landscaping. As far as I can tell there seems to be a connection to a Waterden Hill Hall which was described as ‘near falling down for want of an inhabitant’ in 1678. Today, wherever Hill Hall existed (possibly now known as Waterden Farm), it is only 3 or 4 kilometres n0rth from Waterden farmland to one of the most gorgeous pieces of Palladian architecture in England. The south front of Holkham Hall, Norfolk. Thomas Coke started Holkham Hall in 1734, with the intention of housing his wealth of Grand Tour treasures as well as showcasing his appreciation of classical art and culture. The awesome nature of Holkham is found in the magnificent Marble Hall with its plaster dome ceiling and alabaster shipped from Derbyshire – ingredients which marked the beginning of a new era in country house building and design. There is much to be said about Holkham Hall and Thomas Coke. He was well acquainted with Richard Boyle, Earl of Burlington and William Kent, he was clearly a key part of the social network known as the ‘dilettanti’, but like many elite men of his generation he made hasty investments and financial losses during the South Sea Bubble in 1720 delayed the building work. It is likely therefore that Holkham may have been started even earlier if it was not for this depletion of funds. Minster Lovell and other Coke estates were but stepping stones to greater things. The old Oxfordshire manor was incredibly outdated, dusty even, it was too compact and secluded. The characteristics which presumably had made it attractive to Sir Edward Coke were now disadvantageous. The new house at Holkham was meant to be an architectural cabinet of riches. Coke’s sculptures were to be displayed in his Marble Hall, and so numerous were they, that some were placed in the dining room and a gallery which incidentally was also used for entertaining. The experience of visiting Holkham Hall both in the 18th century and today is certainly one of pomp. The educated Coke returning from the European Continent was a sophisticated, well-connected young man, and was eager to declare this to a wider audience. Upon advancement to the peerage in 1728 with a title which linked him so closely to Minster Lovell, Coke had already been planning his new house, he was just waiting for the right moment to begin. This was all about consolidating funds and creating a grand establishment from where the Coke estates could be efficiently administered. Anything resembling a residence on the other estates could be leased and therefore generated further income. However, the Cokes still held onto the manor at Minster Lovell, even selling off building materials from the house in 1747. The remainder of the land still in the possession of the Cokes (mainly woodland) was sold by 1854. Unfortunately, Thomas Coke never got to see his new house on the Holkham estate finished, dying in 1759 around the age of 62 and still struggling to recover his financial losses: it would take another five years for the house to be completed. His descendants still reside at Holkham throughout the year, and make regular use of the state rooms out of season. My house move is rather more ordinary. I do not have estates to manage, or capital to expand. My dynastic legacy will still be a suburban semi-detached house with a garage and garden. Nor do I have aspirations to appear on Grand Designs, but if I did have the finances, I’d be sure to purchase a good bit of land and build something suitably generous and accommodating. * According to the index of Holkham Hall papers, audit books for the 1720s show estates in Suffolk, Kent, Dorset, and Norfolk, amongst others. As Bletchingdon Park, Oxfordshire goes on the market for a cool £20,000,000, I thought I would construct a small piece of research for my own records. However, I was ultimately distracted by a smaller house nearby – Heathfield House. After some internet searches I found I liked it a lot; it was an easy thing getting hooked by its particularly unpretentious history. Heathfield House, Bletchingdon, Oxfordshire (East or garden front). As the name suggests, Heathfield House was built on scrub or wasteland. This pocket of land originally belonged to Lord Arundell of Wardour ‘a Count of the Holy Roman Empire’ whose tenants had partially reclaimed the land for farming at the end of the eighteenth century. The land was then sold to Thomas Richard Walker (c.1780-1837) in 1814 for about £10,000, and it was he who built the present structure. Walker was an Oxford banker – the nephew of Thomas Walker from whom he had inherited the partnership of Thomas Walker & Co. or the University and City Bank shortly after 1800. The Walker family men were wealthy individuals who held sufficient influence in Oxford and the county. Thomas Walker had been town clerk of Oxford between 1756 and 1795, as well as being made town clerk of Woodstock in 1767. He was well established with successive Dukes of Marlborough and acted as agent for several great local families. Thomas Richard Walker carried on where his uncle had left off; maintaining strong connections with the leading Oxfordshire landowners as well as promoting himself to the status of landowner with use of private wealth gained through the family banking business. 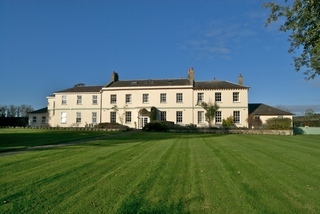 By the time Heathfield House had been completed in 1816, the Walkers had become a part of the local elite; their home was gracious and habitable, it had everything a family required with its private gardens, shrubbery, stabling and outbuildings, as well as views over the Oxfordshire countryside. Their neighbour at Bletchingdon Park, Viscount Valentia, would grow eager to know them. Regrettably there are no surviving building accounts, but there are later records which add flavour to the description given by Wing in 1872. Upon Thomas Richard Walker’s death in 1837 Heathfield House and other real estate passed to his eldest son Rev. Henry Walker (born about 1810). Henry probably didn’t live at Heathfield but due to the requests of Thomas Richard Walker’s will, and perhaps as an attempt to keep the house occupied and in the hands of Walker family members, another of his sons, George Richard Walker bought the house from his brother Henry in 1842 for nearly £14,000. Most of the surviving records date from this period, and reveal just how commodious and yet comfortable the house was at this time. Census returns of 1851 and 1861 show a simple set-up of George, his wife Charlotte and two or three servants at the most. George and Charlotte had no children and so their domestic arrangement contrasted greatly with nearby Bletchingdon Park with its eight or nine family members and 14 servants for those same years respectively. When George became a widower in 1863 he devoted his time to the study and experimentation of horse diets; something he even published a pamphlet on in 1865 (the full title is given below). Yet, Heathfield may well have seemed lonely, and it likely he started to contemplate a move. The most gorgeous of the surviving documents is certainly a couple of inventories which were intended as material documentation by George Richard Walker when he eventually sold Heathfield to the 11th Viscount Valentia in 1868 for the generous sum of £21,890 (the National Archives calculate this to be about £1 million in today’s money). George compiled a full inventory of the house and contents with estimated values listed in the right hand column. He then wrote out the items which were to remain at the house after the sale and passed this volume to Valentia. My favourite is the drawing-room which contained amongst other things ten carved chairs with stuffed cushions in chintz covers, an Easy chair, an elbow rosewood chair in green morocco leather, a pair of mahogany card tables, a rosewood centre table with worked velvet and satin cover, and six cushions in needlework. The list of chattels in the Hall also evokes images of how Heathfield once operated, there was a chiffonier (what I coarsely call a sideboard), a double set of croquet mallets and Balls, a pair of camp stools, painted hat stand, and ironwork to stove and hot air chamber. Even the servants’ quarters were well equipped; Painted chest of four drawers, dressing table with two drawers, curtain rail, three Bamboo chairs, painted washstand and white basin, mahogany corner washstand, mahogany bidet, painted dressing table with drawer, and a pole fire screen. The full inventory shows there was once a portrait of Thomas Walker by Gainsborough which hung in the dining room. Not surprisingly, George Richard Walker took this with him, but I wonder where it is now? By 1868, Heathfield had been in the Walker family for over half a century, and it may initially have been with some reluctance that George made the decision to leave. There is no substantial proof, but I believe that Valentia saw some great advantage in the property and perhaps nudged Walker to part with the place after Charlotte’s death. Moreover, and given that the families had been close neighbours for over 50 years plus Valentia’s standing amongst the Oxfordshire elite, it seems rather cynical of George to note him in a Statutory Declaration made in 1868 as ‘Rt. Hon Arthur Viscount Valentine’ rather than ‘Valentia’.From this date though, the house was completely in the ownership of the 11th Viscount Valentia, who leased the property to Hon. Cecil T. Parker (a son of the 6th Earl of Macclesfield) and his family for a short-term, before setting the house up as a dower house for his mother Flora and her second husband Major General Hon. George Talbot Devereux. In 1901 Charles J. Stratton (a descendant of George Stratton, Governor of Madras) and his wife Florence resided at Heathfield. The 11th Viscount Valentia died in 1927 and the Heathfield estate passed to his son Caryl Arthur James Annesley (12th Viscount) who attempted to sell the property to Col. John Alsager Pollock in 1928. Pollock had borrowed money from Valentia in order to buy Heathfield, but defaulted on his payments and eventually fled his many creditors, and the country before 1935. After a couple of years, and with great difficulty and expense, Valentia sold Heathfield to Violet Blanche Ruck-Keene, widow of William George Elmhirst Ruck-Keene. There is little evidence to suggest Violet lived at Heathfield House, but the house would certainly have suited her needs. Even today, it rests quietly beyond the busy A34 and M40 roads. Needless to say, Heathfield has become the ideal location for its present-day use as a privately run care home with renowned high standards maintained by Clive and Pippa Hawes. It is neither flashy nor drab and sits snugly in the landscape. I admit to liking the magnificence of large country houses that impose themselves on the landscape and alert you to their presence through the avenues of trees and gaps in stocky park walls. And yet, Heathfield is the kind of country house which almost defines the ideal of country living. It is unpretentious, and that has everything to do with the vision of the Walker family, but it is also genteel and indeed commodious. Perhaps one day, I could discover more about the Walker family and their mark upon the Oxfordshire landscape. Like many late eighteenth century professionals their aspirations to join the elite meant hard work and self-promotion through clever land purchases and building work. Places like Heathfield therefore retain their stature, and can often make themselves ‘useful’ in modern times because of their size and functionality. The small country house might not have all the necessary associations with local grandees and their political hosting, but they nonetheless have influence on their surroundings and the social hierarchies of the time. May the purchaser of Bletchingdon Park know their local history. . . The pamphlet George Richard Walker wrote on the care and diet of horses is, Horses, Their Rational Treatment, Causes of Their Deterioration, and Premature Decay: Race Horses, Their Mismanagement, the False Aims of the Jockey Club, and of Trainers Considered and Explained. Reflections on the Objects, and Result of the Grants of Public Money for Queen’s Plates (Slatter and Rose: Oxford, 1865). William Wing, Annals of Bletchingdon in the County of Oxford, (1872). Walker family papers and those of the Viscounts Valentia are held at the Oxfordshire History Centre. Deciding on an afternoon out and the difference between an £18 entrance fee or that of £5.50, I stumbled across Buscot Park in my copy of Hudson’s Historic Houses. So on a fine sunny day last month I travelled through some of the more quaint areas of English countryside to make my first ever visit to this intriguing house and its pleasure gardens. My first impressions were that this National Trust property was well-organised, yet amiable and undemanding. A feeling the National Trust are seeking to achieve ever more with their properties these days. From the ticket office, it was a steady walk to the house (which can only be caught as glimpses through the banks of trees) through the walled garden and up the stepped path to the open lawns of the south front. The house in its original form was built for Edward Loveden Loveden between 1780 and 1783. Small additions were made to the house after these dates but after Loveden’s death in 1822, his successors cared more for cultivating lands elsewhere particularly those already belonging to the family in Wales. By 1866, Buscot was eventually put on the market and was bought by the Australian Tycoon Robert Tertius Campbell whose own wealth had been made in the gold trade. Over-ambitious, Campbell died in 1889 leaving the Buscot estate in great debt, and it was then sold to Alexander Henderson, later 1st Lord Faringdon (1850-1934) a financier and politician. His son, Gavin Henderson, 2nd Lord Faringdon was member of the ‘Bright Young Things’ with staunch socialist ideals. During his ownership of Buscot Park the house was regularly used as a venue for fellow politicians and formidable art collectors. Indeed, most of the pictures at Buscot were purchased by the second Lord Faringdon and make up the larger part of The Faringdon Collection – the combined collections of the first and second Lords Faringdon at Buscot and at a separate London property. By far the most popular of pieces in this collection are the Edward Coley Burne-Jones (1833-1898) paintings depicting the Legend of the Briar Rose in the Saloon. The beauty of these paintings are magnificently displayed as Burne-Jones intended with their extra inserted panels and gilded frames. Moreover, their drama instantly gave Burne-Jones the reputation he sought as a painter of medieval legend. At the time of their purchase and installation for Buscot in 1895, Burne-Jones was staying at Kelmscott Manor a few miles away (the home of his dear friend William Morris) so his involvement at Buscot and the placing of these paintings are a key creative connection. There are a good sample of rooms open to the public, each with information folders on the objects and art on display. Buscot has a great atmosphere throughout, and the staff were fantastic and approachable – even when my mobile phone made its presence clear on the stone staircase and I had to turn it off! The National Trust are eager to eradicate the past stuffiness of previous generations of guardianship at their properties, and at Buscot this was very prominent. But, recognition must be given to the staff and the present Lord Faringdon and his wife for the sense of continued pride in this property. This also extends to the grounds where the modern mixes well with traditional landscapes and concepts, and should be made a part of every visit if time is allowed! There are several tree-lined avenues to the east and the celebrated Harold Peto Water Garden leading to the Big Lake with its picturesque rotunda and bridge. At every turn there is something unusual set to catch the eye; perhaps a deliberate mechanism evoking those garden designs of the seventeenth and eighteenth centuries which sought to surprise the visitor. To the west are the walled gardens which mark the start and end of the visit to Buscot and serve to remind any visitor of the lengthy programme of care the present workers and owners are undertaking.